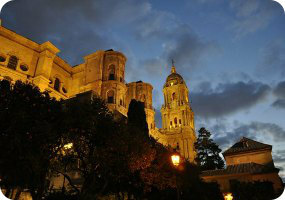 Book now the best shore excursions in Malaga. High quality and safety at the lowest prices. If your are looking for the best Shore Excursion Malaga, book now the best guided tours at lowest price with Ancora Tours. Since 2003 we offer you official guides in english, transportation and travel insurance, all included. The highest quality at the lowest rates. Malaga lies on the Costa del Sol and boasts stunning natural landscapes. The city of Malaga, birthplace of Picasso, offers numerous attractions to discover during our shore excursion, from the historic citadels of Alcazaba and Gibralfaro, to the beautiful cathedral with its unfinished bell tower. What’s eating: Malagan salad: made with potatoes, oranges and cod fish. Gazpacho: a cold soup (almost … a drink!) made out of, tomato, cucumber, bell pepper, onion and garlic, olive oil, wine vinegar, water, and salt. Souvenir: A Picasso postcard or print to hang at home. We’ll take the bus from port and head to the highest point in Malaga to visit Castillo de Gibralfaro. Nearby is the Alcazaba, an Arabic fortress dating back to the 11th century. After we’ve admired the great view of the city, we’ll visit the ruins of a Roman Theatre which is just next door. Next up is Malaga Cathedral, one of the most important monuments in Andalusia. This beautiful Renaissance church has the charming nickname ‘La Manquita’, meaning the one armed lady. This comes from the fact that the construction of the second bell tower was never finished. Our shore excursion in Malaga continues in Plaza de la Merced, where we’ll stop outside the birthplace of Pablo Picasso. Then we’ll follow some of the city’s main streets such as Calle Granada, Calle Marqués de Larios, until arrive at Plaza de la Marina. From there, we’ll walk along Paseo del Parque, which runs alongside the greenery of Malaga City Park, we’ll reach Plaza de Toros de la Malagueta. From here we can see the city’s 16-sided bullring before meeting the bus to return to port.